No one appreciates a dirty staircase. No one. It becomes worse when the staircase is populated with stains, dirt and all manner of unsavory things, making your home, office or business a complete eyesore. For some homeowners, this sad eyesore makes them simply want to throw-up anytime they climb the flight of stairs either to get to another room and leave the house/building. Sadly, many homeowners imagine that cleaning the stairs of their homes is such a tedious task that cannot be undertaken directly by them at home without the help of a smart and dedicated home cleaning professional. If you currently have a dirty stairs carpet – and are interested in how to both clean and maintain it yourself at home, these 9 smart and easy steps below are all that you need to succeed. These steps are super simple and very easy to execute: all that is needed is probably what you already have in your house cleaning arsenal already. Aside what you already have, the next most important thing is your ability to both follow instructions and to allow yourself to be (properly) guided. The 9 steps below, you must note, are in logical order – meaning that, you need to follow them exactly as laid out below if you’re to record the results that you so dream and absolutely cherish: a shiny and sparkling stairs carpet in your home. Note: we’ll start with tips that will avoid getting your stairs carpet soiled in the first place. Remember, no soiled carpet, no stress of cleaning and sweating. The number 1 rule of maintaining the carpet on your stairs at home, in your business premises or anywhere else to make certain that you do not bring in shoes or any other footwear for that matter right into the room/building and unto the stairs. For residential apartments, it is best if you make available easy slippers for yourself and other family members so that once in the building, the dirt afflicted or mud tied shoes are removed and the indoor slippers changed into. This will smartly ensure that you hardly get stains, mud, dirt or dust on the carpet on your stairs in the first place. In the world of cleaning, especially home cleaning, this is called the first rule of cleaning: prevention. Getting a dedicated foot mat for the stairs of your home, office or business is the next best step, right after relying on indoor slippers. It is also a super practical option to getting visitors to take off their shoes and use a pair of slippers. Strategically placed foot mats at the entrance of the building and right at the beginning of the flight of stairs will ensure that the dust, dirt and general particles carried on one’s footwear are dropped off – far from the stairs. Now, if you don’t allow dirt to get to your staircase in the first place, how would you wind up being in a position to clean what is not even there? Perhaps, one of the most annoying things you’ll ever face in life is the experience of a smelly staircase…few things beat it, especially if your carpet is the rug variant. To avoid this calamity and ensure that you do not have to bother with cleaning your carpet every now and then, it is recommended that you pay particular attention when transporting water, oils or any other liquids across the carpet of your stair case. Aside the fact that liquid stains on stairs carpets are difficult to clean and can smell a tonne, they can also cause slips that are particularly dangerous to Seniors, the elderly and children – if these people also share the house with you. 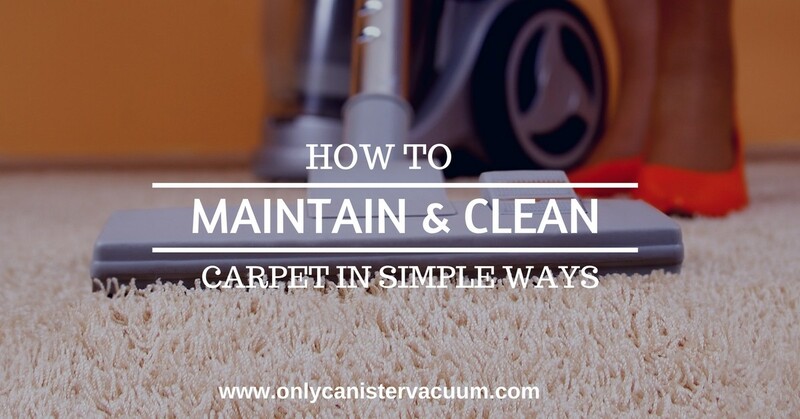 Now, we’re done with the preventive part of the article...let’s now focus on the task of showing you how to really get a dirty carpet on your stairs immaculate and super clean again. Dust and other dirt usually gets soaked up in the carpet – over time. This is especially true if the first 3 preventive measures listed above are not religiously followed or worse, are not followed at all. To begin the stair carpet cleaning process at home, it is very important that you begin the process with raking out the dust and dirt the carpet has accumulated with the view of giving it its first vacuum touch. A short broom is the favorite raking tool for this task – and your job is to run it against the grain of the stair carpet so that all the dust and dirt hidden under will be ruffled and brought to the fore, ready to be tackled and cleaned off. For a dirty carpet, right after raking it, you will be astonished at the amount of dirt that will come to the fore. What are you supposed to do with this dirt? Vacuum it right off the stairs and carpet with a vacuum cleaner – no matter the type or model. This will present to you a breath of fresh air – and will give your carpet a fresh look that though, is not close to neat, will be far better than what your stair carpet/rug was a moment ago. This is the very second step towards getting your shinny and glittering rug back. If you’ve made it thus far, hold still – and follow through to the next point, your stairs carpet is about to return as clean as new for you. The next step – right after raking and vacuuming is to shampoo the stairs carpet thoroughly. The act of shampooing the staircase carpet in a thorough manner is to clean the dirt that is inherent on the carpet and importantly, give it the chance to shine – and be like the brand new carpet you bought, years back. To achieve this, you should add shampoo to water in a sufficient quantity and ensure that it actually foams. When you are done getting the shampoo foam correctly, kindly sprinkle the foamed water liberally and scrub the carpet with a brush in a firm manner. This will brilliantly ensure that the dirt that pilled under the carpet – from every conceivable angle is forced out, leaving your carpet once again desirable. After firmly scrubbing on the stairs carpet to remove the dirt therein, the next logical step is to ensure the removal of the water from the carpet. To achieve this however, you must first add more water to the foaming shampoo on the carpet so as to neutralize its foam. Excess water on the stairs carpet can be removed by a sophisticated vacuum with a wet application function and importantly, the ability to bag. If however the upright vacuum cleaner available is incapable of handling the super wet rug or carpet, your best bet is to manually sweep the water off the carpet and completely off the stairs to give room for another phase of the stairs carpet cleaning exercise. Dying the carpet should not ordinarily be a challenge. If you have an industrial dryer, you can simply put it to good use and dry out the entire carpet in a matter of a few minutes. However, if you do not have such a powerful and fancy accessory, your best bet is to open the windows and doors wide and allow the carpet to dry naturally via the open air. Note however that allowing the carpet to dry by air naturally is more time tasking and is going to take more than a day if the elements and relative humidity do not allow it. To fasten the process, it is smart way to power on the air conditioner and fan so that the drying process will be accelerated. While the carpet is drying, make certain that no one goes on it again with dirty feet or footwear again – at least, not until the whole carpet dries out completely. Finally, to round off your stairs carpet cleaning routine, vacuum again – thoroughly. This last vacuuming exercise clears out all the dirt and remnants of stains and unwanted elements off the carpet in the smartest of manners. Usually, this point leaves the carpet as fresh as when it was newly bought, shipped and installed on the stairs. If you can afford an air freshener, kindly deploy it and you’re sure to get both your stairs and the carpet that adorns it in great shape again – much to your utmost joy and satisfaction. Cleaning the carpet that adorns your stairs is not an easy procedure – irrespective of your skill. It is also a super tedious task – as the lines above have clearly indicated. However, after ensuring that you take the necessary steps to clean your hitherto dirty stairs carpet, isn’t it smart to ensure that dirt stays away from it this time around? I think so – and in that respect, must refer you back to the first 3 points this article made. I also think that, the prevention bit is well smarter than the actual cleaning process!